Videos add a new interactive and immersive dimension to online training. They allow employees to watch favorable behaviors in action so that they can replicate them in the real world. These powerful online training tools are also great for product knowledge since you can show off every feature or function. But producing the perfect online training video is an art form. You need to know what to include and what to leave out in order to improve retention and employee participation. Below are 7 elements you should omit from your online training video demo. The host or presenter is supposed to facilitate knowledge transfer instead of serving as a distraction. Not be some quirky presenter who detracts from the subject matter and makes it difficult to absorb the crucial ideas and concepts. For example, a host with an over-the-top personality or accent that is difficult to understand. The content should be most memorable to your employees. If you don’t have any live actors who fit the bill, consider an animated host. Many rapid eLearning authoring tools have built-in characters, complete with interactions, who can demo tasks, skills, and products. Chances are, you’ve sat through an online training video demo that featured loud background music that overshadowed the presenter. If you were lucky, it even contained some catchy rhythms that stuck with you long after watching. Distracting background audio does not have a place in online training video demos. Employees should be able to focus on the narration and visuals, instead of trying to block out annoying beats. It’s not only the hosts that have the power to upstage the subject matter. Video characters can also distract your corporate learners and overwhelm their mental synapses. For example, the animated employee has unusual personality traits that steal employees’ focus. Rather than paying attention to the compliance task or product, they want to know the cartoon’s personal life. Characters should be interesting, but not so captivating that corporate learners lose sight of the learning objectives. It’s perfectly acceptable to include a brief bio or explanation for the in-video characters, as well as the situation they’re currently facing. That said, you should meander into tangents about what the character had for breakfast that morning or delve into their family histories. Confusing backstories take away from the online training value and frustrate corporate learners, given that they are unable to decipher what’s relevant from extraneous info that’s just there for entertainment purposes. As is the case with online training courses, online training video demos should only feature relevant images and graphics. You may want to wow your viewers with stunning imagery, but only include elements that support the learning goals and objectives. For example, your online training video demo centers on a new product that you’re just about to launch. Show employees how the product works and how to properly maintain it, as this will help them craft the perfect sales pitch by conveying the key features to consumers. However, you don’t necessarily need to include a detailed diagram of the product’s inner workings or a development timeline. You might be surprised to see this item on the list, but dazzling special effects are another attention-grabber for all the wrong reasons. By all means, you should incorporate some special effects to enrich the online training experience and entertain audiences, but don’t go overboard. There are plenty of interactions and visual effects to choose from, especially if you have a robust rapid eLearning authoring tool with an impressive online asset library. However, you need to resist the urge to incorporate every eye-catching element into your video production. This is yet another common mistake that diminishes the value of the online training video and makes corporate learners lose focus. You don’t need to include every last detail in your online training video demo. It should only feature the essentials that employees need to know to perform the task or mimic behaviors. In fact, too much information can cause cognitive overload, which defeats the purpose of incorporating videos into your online training course. Meet with a Subject Matter Expert to determine which information to include and what to omit. You can also research your audience’s needs to gauge their preexisting knowledge and then go from there. No need to cover details they’ve already assimilated, as you can simply offer a brief refresher in advance and concentrate on new facts and stats to add their mental schema. One of the most important things to keep in mind when developing online training video demos is that you must respect the format. It’s true! Employees do have the ability to pause the video at any point, but they typically watch in one continuous play. This gives them the complete picture so that they can apply the information in the real world. For example, they watch a POS task demo and then immediately venture onto the sales floor and ring up a customer. Text blocks impede this process due to the fact that your corporate learners have to stop the online training video, read what’s on the screen, then try to regain the immersion instead of just viewing the demo and enjoying the overall experience. Avoid text blocks and opt for bullet lists or display standout excerpts from the audio narration. You can also include subtitles to make the content more accessible. Online training video demos are supposed to engage viewers and improve memory retention. However, these 7 elements can make your online training video have the opposite effect. Use this article as a guide to produce more entertaining and insightful online training video demos that help corporate learners focus on the takeaways instead of serving as an online training distraction. Online training videos are particularly beneficial for sales of online training. 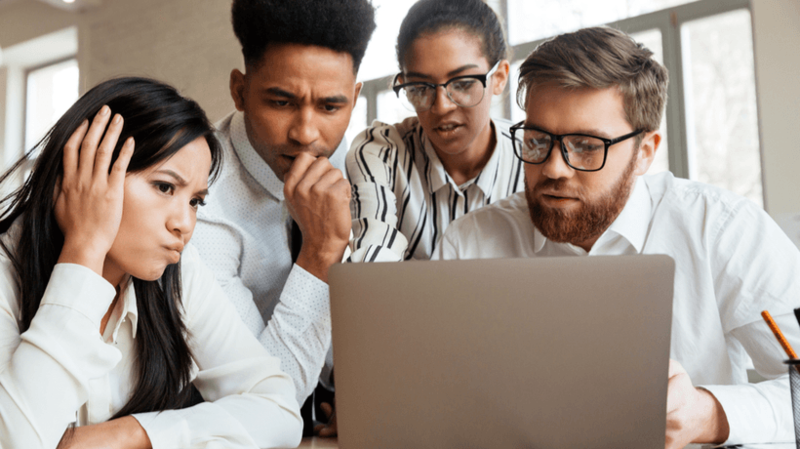 Read the article 8 Best Practices For Using Sales Online Training Videos to learn how to enhance your sales online training with dynamic sales online training videos.